To post a job, you will first need to register an account. After registering, you should be redirected to the Post Job page. If not, click here to post a job. This package allows you to post a single job that will be live on our job board for 30 days. This package also allows you to post a single job that will be live on our job board for 30 days but your job will be ‘stickied’ at the top of our homepage and all relevant searches. For example, if you post an Audit job, anytime someone searches for ‘Audit’ your job will appear before all other job postings, regardless of how long ago your job was posted. 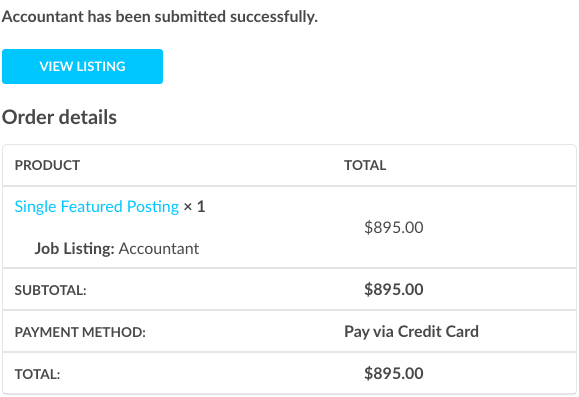 This package allows you to post 2 jobs that will be live on Accountingfly for 30 days. You may post one now and the other at your convenience. They do not need to posted at the same time. This package also saves you $150 across all three postings. If you have an existing job package, you may choose to use one of your credits to post your job. When presented with the Choose Package page, simply select one of your current packages, and Accountingfly will deduct one of your remaining credits to post the current job. 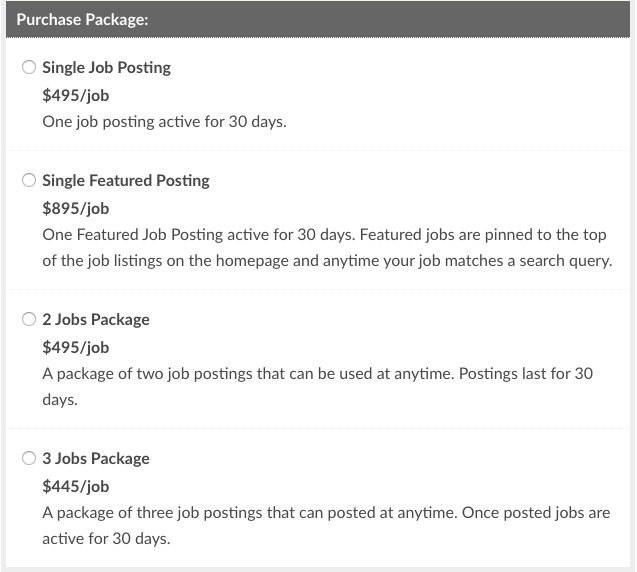 After choosing a package, you will enter your posting details and preview your job. Note: Each time you post a job you can either duplicate one of your currently posted jobs and edit it as needed, or you can start fresh with a clean template. If you start fresh, you will need to re-enter all details in the posting, including your Company information. We recommend keeping a document on hand to easily copy/paste these details. If you want to collect resumes on Accountingfly and use our Applications feature, you will need to enter your email address in this field. 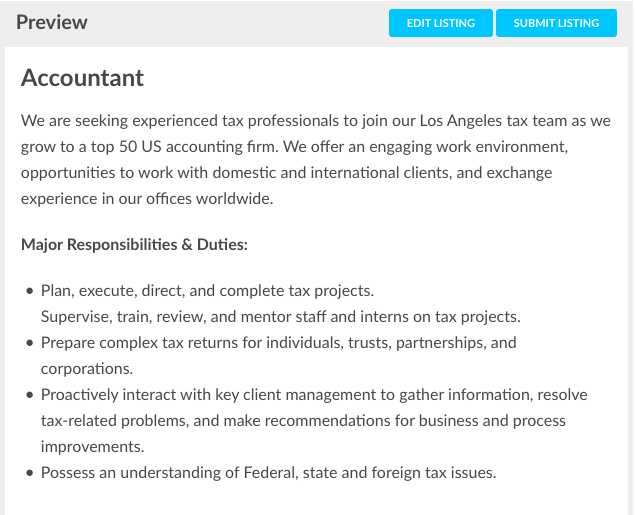 If you want to direct applicants to your own ATS, simply enter the URL to the job. After entering all of the posting details, click on Preview to head to the next screen. After entering your details, you will be given the opportunity to preview your posting. When you are happy with your posting information, click on Submit Listing and you will be taken to the payment screen. After you approve the preview, you will be asked to pay for the posting. You can select a previously saved payment method, or if it’s your first job, you can enter your credit card details. Once submitted and payment approved, you will see an order confirmation screen.